WOW Escape Journey 06 is the final episode of this point & click escape game series developed by WOWEscape. In this game with six levels, barn swallows are the most widespread species of swallow in the world. They are extremely agile in flight and spend most of their time flittering around us catching insects. Every year, the birds move 8300 km by sea route from Argentina to California for their breeding. Help the barn swallows overcome all obstacles during their migration in each level by finding useful objects, hints and by solving puzzles. Interact with the objects by clicking on them. 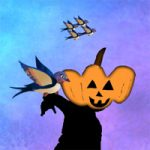 You are going to play the final level now: after all sorts of tragedies, the birds yet got trapped inside a Halloween world! Your final mission is to help the birds reach their destination. Good luck and have fun! Nice game, thank you. I like the addition of the riddles. Unknown: You need another clue from the rock. The stick that goes in it is, I believe, in a far right scene laying on the ground. I had a lot of fun with this series. Thanks, WOW! Can't understand the abcd hint in second set of scenes. can anyone help me? Took me sometime to realise that you enter number of the candy clue as a word! Very nice!! Missing one piece of final pumpkin candy. I think it's something to do with helping the bird?>? POP, needed one more candy for graveyard...found in far left scene with bridge on right in bushes. Great series of games, thanks WOW. Please offer more like this! It was a nice journey! Thank you very much WOW!